Religious Freedom (acrylic on canvas) 36" x 34"
In the Bill of Rights, the addendum to the Constitution of the United States, James Madison expanded on the freedoms of citizens outlined in his previous document. This 1789 draft set forth 17 articles, 10 of which were ratified by Congress in 1791. The third article article approved was that "…no law establishing religion or prohibiting the free exercise thereof, nor shall the rights of Conscience be infringed." This is the First Amendment to the Constitution. Freedom of religion, for many, was one of the main reasons that early settlers immigrated to the United States from countries where their personal beliefs were surpressed and their lives threatened. 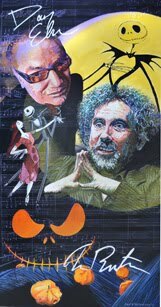 The United States, for the most part, is a bastion for religious tolerance, it is not near perfect in protecting or upholding laws created by religious bias. Muslims today are experiencing backlash from the small numbers of terrorists who have corrupted the essentials of their beliefs and politicized them. Other groups are using segments of the bible to justify restriction of rights for women, gays non believers. 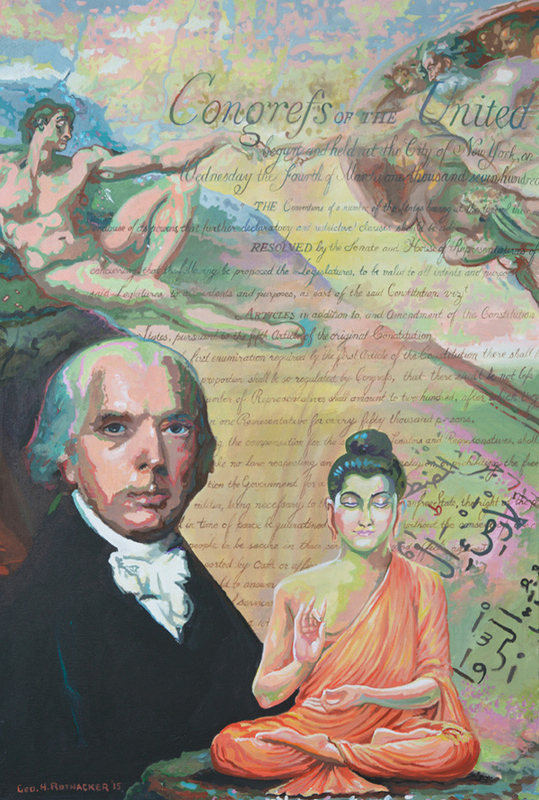 My painting combines the Koran, Buddha, and Adam and God with James Madison and his writings for Bill of Rights, a document which still essential to the tenants of the laws and freedoms defined for America.